Strong winds and arctic air on the heels of a feisty clipper-like snow storm brought extreme cold to Minnesota, the likes of which that have not been seen in over 20 years. The bitter cold brought some natural gas shortages just north of the metro and power outages to about 7,000 in the southern and western suburbs. Xcel Energy asked customers statewide to reduce their thermostat setting to 63 degrees. There were also broken water mains, and emergency personnel were busy with frostbite reports. Schools were closed for four days for many in the Twin Cities and outstate. The University of Minnesota was closed on the 30th and postal mail service was stopped statewide. Perhaps more noteworthy was the extremely cold wind chill temperatures with this event. The Twin Cities saw twelve hours straight of -50 degrees F or colder wind chill temperatures from 7pm on January 30 to 6am January 31. With the coldest reading of -55 at 11pm January 30. This was the coldest wind chill reading in the Twin Cities since January 19, 1985. 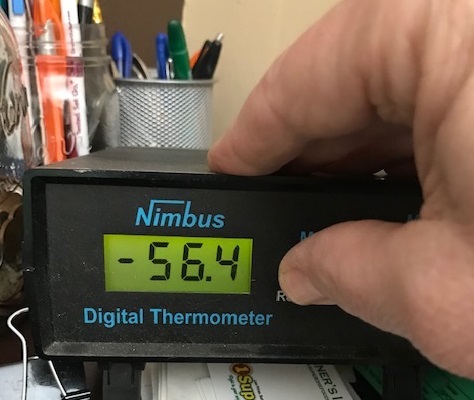 A number of locations in northern Minnesota saw wind chill readings of -60 degrees F or colder including -65 degrees F at Hibbing at 8am on January 30. Below is a listing of the coldest wind chills observed and coldest temperatures (below) observed as of 12PM Wednesday.